Boy am I glad that I found Naomi Murrell on the decor8 blog. Her work was featured at the top of Holly's Etsy Take Five Tuesdays feature, and I can definitely see why. Adelaide-based Naomi's punchy graphics are fun and folk-inspired and I love the way she has styled her prints so that you can imagine them on your own mantle piece. This Flock print (pictured) would definitely pass the test in our household - a feminine style that isn't too girly in the navy and red colourway. I also can't wait to see the launch of of Naomi's jewellery line (for a sneak preview, check out her blog - you'll find a few wooden and acrylic necklaces and brooches to whet your appetite). And on top of being an artist, illustrator, designer and jewellery-maker, Naomi also designs fabric patterns for Sproutdesign, alongside some of Australia's hottest fabric designers. 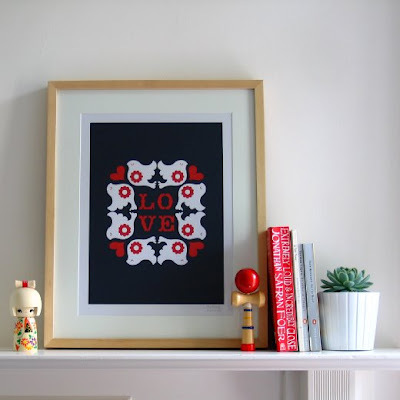 You can buy Naomi's prints (and soon jewellery) on Etsy, fabric designs on Sproutdesign, get an overview of Naomi's art on the Naomi website and find out all about her latest exhibitions and projects on her blog.